The Cle Elum area offers many fine birding opportunities, including the freshwater marshes and ponds popularly called the "Railroad Ponds." Also known as the Northern Pacific Ponds, these were formed when railroad construction impounded some of the waters of the Yakima River. Cle Elum is in a transition zone between the moist coniferous forests of the Snoqualmie Pass-Easton corridor and the drier Ponderosa pine zone. Much more precipitation falls near the summit and on the west side, decreasing down the east slope of the Cascades. Cle Elum's climate is moderately warm in summer and very cold in winter, usually with a moderate snow cover. The ponds have typical marsh vegetation - cattails with surrounding willows and cottonwoods. Snags provide nesting and perching sites. Across the road from the ponds to the north are swales with thick shrub cover and, usually, standing water. A spring or summer birding visit may produce a substantial bird list. Possible waterbirds include Mallards, Wood Ducks, Hooded Mergansers, and Barrow's Goldeneyes. Virginia Rails may be heard calling from the cattails. Red-winged Blackbirds vocalize in the late spring and summer months. 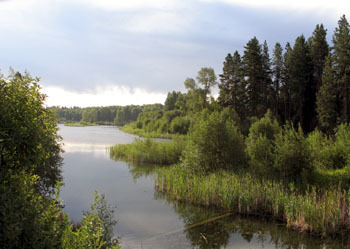 Osprey nest nearby and fly over the ponds and nearby Yakima River. Five swallow species may be seen here (Northern Rough-winged, Barn, Tree, Violet-green, and Cliff). The shrubby edges and hillsides are excellent for Yellow-rumped, Yellow, MacGillivray's, and Nashville Warblers. In the winter, watch for Bald Eagles along the Yakima River, and check the residential streets of Cle Elum (2nd and 3rd Streets, in particular) for wintering Bohemian Waxwings and Evening Grosbeaks. Feeders attract not only House Finches, but also Purple and Cassin's Finches. May, June, and July are the best months for a substantial bird list, but winter birding can also be productive. From I-90 eastbound, exit at #84 (Cle Elum/South Cle Elum), descend toward town, and turn right at a sign for South Cle Elum. A few feet after crossing under I-90, turn right on a one-lane road. The ponds are on the left. From I-90 westbound, take Exit #85 and bear right (north) and then left onto State Route 970. Descend toward town, and turn left at a sign for South Cle Elum. A few feet after crossing under I-90, turn right on a one-lane road. The ponds are on the left. There are no entrance fees and no facilities. Bird from the gravel road, pulling well off to the side.